A lot of people think that it's impossible to keep a secret, that the more people that know of something, the less possible it is to keep secret. But that's not always true. Throughout history, entire nations have kept secrets. Yesterday I learned, via Cronaca, that an Elizabethan warship has recently been discovered and analyzed. (The video at this link is nice.) They recovered its guns and learned that the English were ahead of their time using standardized guns and cannonballs. All the other navies of the day were using cannon built one off, with nonstandard ammo. How could we not know this? Clearly, standardized weapons were critical for England's military success against the Spanish Armada. Keeping that a secret gave them quite an edge against their enemies. With standard guns, the English could have consistent training, gun tables, etc. Other navies had to have more specialized training on each gun. The Brits took a huge part of the art out and made it more scientific. And no one else knew, until now. "It is known that during Elizabeth's reign, English sailors and gunners became greatly feared. For example, at the beginning of Henry VIII's reign, the English fleet was forced to retreat from heavily armed French galleys. "By the time of Elizabeth, even Phillip of Spain was warning of the deadly English artillery. But no-one has ever been able to clearly show why this was." The Byzantine Empire used a weapon called "Greek Fire." No one knows what it is, the leading theory is that it was a naptha-like flame thrower. Supposedly, the Byzantines killed those the knew how to make it, to prevent the secret from getting out. The ancient Greeks had their entire religion kept a mystery. Only those initiated into the higher levels of priesthood were taught the Eleusian mysteries. Those in the know died off after thousands of years of dominating Mediterranean culture. Clearly, secrets are capable of being kept for quite a long time. It makes you wonder what have been kept, and are still being kept, that we don't know about. Although the look isn't especially different, the mechanics behind the blog have been substantially revamped since late last year. I started using the latest version of iBlog late last year. Because I have highly customized the interface instead of using a standard interface, the upgrade was quite painful. The most recent improvements were quite painful to install, too. This website began around 1997, long before blogs existed. As it gradually resembled a blog and I learned that what I was doing was blogging, I've been adding standard blog features. Bad Law: Very opinionated comments on law. Education: Criticisms of the government's involvement in institutionalized behavior modification. Environmental Fascism: Reasoned observations on irrational use of fuzzy animals to effect political change. Guns: Yeah, guns. Mostly politics about guns, but it could possibly include observations on the skills of shooting. Iraq: Mostly my experience in Iraq, but also the part of the war on Islam as it applies exclusively to Iraq. Journalism: Mockery of those that think that commenting on current events requires a special, protected caste. Military: Miliatary topics not related to politics, the war on Islam, or Iraq. Rants: Anything not already in another category. Religion: Commentary on irrational belief systems, excepting environmentalism. War on Islam: Discussion of how to eradicate this inhuman belief system from our world. Only the ten most recent rants will show on the main page now. To see others you'll have to click on the archives link at the bottom. Also, you no longer have to go to click to see the entire rant, the entire piece of drivel is shown on the main page and on every page where it is displayed. This should make it easier to read and I'm glad I'm finally getting rid of that unnecessary extra step for people to read the whole thing. I've relented on my decision to back out my blog. I have decided that I just had to contribute to the global conversation, and whatever the merits of my opinions, they are mine and worth it to me to publicize. The site has been revamped. I expect to do more fine tuning shortly. Change was promised. Vague change. No two people could identify what that change would entail. This was by design. Each of us could paint onto Him whatever hopes and characteristics we wished to see. We elected a Personality, not an idea. As He likes to brag, He won. It wasn't His ideas that won, He never really shared any ideas. It wasn't His policies that won, He never held any. It wasn't His background or experience that won, He didn't have any. And He won. Now, no matter His ideas, no matter His policies, no matter His background or experience, it is He that we elected, and now He can do as He pleases because no matter what He does, it is blessed by the election. He carries that blessing to all that He does. This is the danger of electing a personality. There is no perfect person. There is no fool proof system. There are no guarantees when we elect someone to office. Anyone can be corrupted. This is why we usually insist that our leaders express a philosophical base, backed up by experience. When they take office they can claim a mandate for that philosophy, and we can demand adherence to it. His mandate is not a philosophy. His mandate is Him. And we are stuck with whatever whims of His own personal agenda He decides to put forth. And among other, more obvious dangers of a cult of personality, He is a communist. 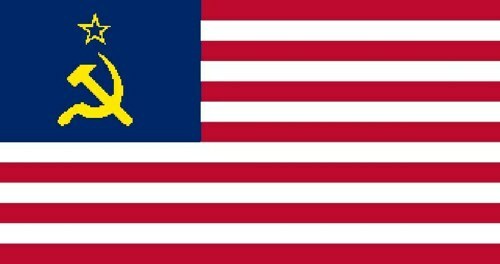 The Communist Party of the United States of America has succeeded. We lost the cold war. Kruschev was right, they have buried us. After a life spent defending this nation against communism, I am now forced to admit that we are now communists.